The quality and character of the tea, not unlike wine, is also affected by altitude it is grown at, the climate and annual weather, the seasonality of the region it is grown at and the type soil. Although tea plants are very adaptable, allowing it to grow in many different locations, better quality teas tend to be grown at higher altitudes and also prefer a humid climate with some seasonality. The term ‘white tea’ derives from the tiny silver-white hairs that can be found on the delicate, unopened leaf buds. It is traditionally made using that just little bud, but certain varieties also add one or two of the youngest leaves. It is an unoxidized type of tea with a fairly straight forward manufacturing process. The bud (and the young leaves) are picked with care, to avoid damaging the leaves, which could start oxidation. The tea is then left to dry, ideally directly in the sun, but special drying rooms are also used. Green tea, another type of unoxidiZed tea, dates back to Ancient China and it is the first type of tea to be ever manufactured. Over the centuries it has spread to other countries, but the best varieties of green tea traditionally come from China and Japan. Like with white tea, no chemical changes take place within the leaf. Although green tea will be sometimes left to wither to reduce its water content, oxidation is mainly avoided through the use of heat which kills the enzymes. Steaming (Japan) and pan-firing (China) are the two main methods, each producing a tea with a different character. The leaves then undergo an alternating set of rolling and firing, which both dries and forms the leaf. Sometimes the rolling is done by hand, creating distinct shapes, such as the pine needle resembling Lung Ching or the little pellets of China Gunpowder. Yellow teas are an expensive Chinese speciality and they tend to be amid the rarest of teas. They are produced in a very similar way as green tea, with the difference that there is an additional step added of post-enzymatic oxidation. First, the enzymes are destroyed with pan-firing. Then the leaves are warmed with light firing and stored under special mats or damp cloths for a few hours, steaming the tea in the process. This is repeated until the desired look and aroma is achieved. The resulting tea leaves have a distinct yellow-green colour. The infusion is similarly yellow-green and pale, lacking some of the grassy flavours so typical of green teas and instead offering a more mellow and sweet cup. Oolong teas, sometimes also known as blue teas, are partially oxidized teas, with the most known varieties originating from Taiwan and China. The name ‘oolong’ derives from the Chinese term ‘black dragon teas’. These teas are greatly appreciated by tea connoisseurs, due to their complex character and often distinct fruity, nutty and even floral flavours and aromas. Oolongs are somewhere between green and black teas and as such they often exhibit the delightful freshness of green teas and the enticing maturity of fully oxidized teas. The names of the more traditional varieties are often very poetic, for example Iron Goddess of Mercy (Tie Guan Yin) or Big Red Robe (Da Hong Pao). Although the manufacturing process does in many ways resemble that of a black tea, oolong’s preparation requires great attention to both temperatures and timing of the various stages. Additionally, the whole process is not entirely linear, with certain steps repeated many times until the right level of oxidation is reached. It was also this tea that the Chinese labelled black, whereas the tea type invented in mid-17th century for the European market, was called red tea. The discrepancy resulted from the fact that Westerners labelled the tea types based on the leaf colour, whereas China and surrounding countries based the names on infusion colour. Pu erh teas are characterized by the distinct earthy, woody if not slightly ‘mouldy’ flavours and aromas. These post-fermented teas often prove to be a bit of an acquired taste. They are considered to have special health benefits, which lends into their growing popularity in the West. They are predominantly believed to aid with digestion, high cholesterol and might even help shed a few extra pounds. Black teas are the most oxidised of all tea types and because of that also tend to have the strongest flavours. It is most likely the most popular tea type in the world, apart from certain countries such as China. Unlike the less oxisides teas, it has a relatively long shelf life, allowing the compressed bricks of tea to travel across the world and become an important part of trade for many countries. Its production method varies vastly from country to country, but these can be divided into two main categories – orthodox and more modern CTC. Countries such as China, India and Sri Lanka and also Taiwan prefer the orthodox method, which is more time and labour consuming, but results in higher quality tea. After plucking, the leaves are left to wither to reduce the water content. This is followed by a bruising phase, where the leaves are rolled and pressed, which in turn starts the oxidation process. Initially introduced in the 1950s, on the back of the growing popularity of teabags, CTC involves similar stages to the orthodox method, with the difference that instead of rolling and pressing, the leaves are machine chopped. Herbals, including rooibos, and fruit teas encompass a very wide variety of teas that do not contain the tea leaf and as such have no caffeine content. They can be drunk throughout the day and are a great alternative for anyone who’s looking to avoid caffeine. QRpedia is a mobile-based system that uses QR code to deliver Wikipedia articles to users in their preferred language. QR codes that can be directly linked to any Uniform Resource Identifier (URI) can be easily generated, but the QRpedia system adds more functionality. It has been in use at institutions since 2011, including museums in the United Kingdom, the United States and Spain. The source code of the project can be freely re-used under the MIT license. When a user scans a QR-code of QRpedia on his or her mobile device, the device decodes the QR code to a Uniform Resource Locator (URL), using the domain name “qrwp.org”, and whose path (last part) is the title of a Wikipedia article, and sends a request for the article in the URL of the QRpedia web server. It also transmits the language setting of the device. The QRpedia server then uses the Wikipedia API to determine whether there is a version of the specified Wikipedia article in the language used by the device. If so, it will return the article in a mobile-friendly format. If there is no version of the article available in the desired language, the QRpedia server performs a search for the title of the article on Wikipedia in the appropriate language, and returns the results. In this way a QR code can deliver the same article in many languages, even if the institution (in this example the museum) is unable to make its own translations. QRpedia also keeps usage statistics. QRpedia was conceived by Roger Bamkin, chairman of Wikimedia UK, and Terence Eden, a mobile internet consultant. It was unveiled on 9 April 2011 at the Backstage Pass event at the Derby Museum, part of the GLAM / Derby collaboration between the Derby Museum and Art Gallery and Wikipedia. The project name is a portmanteau that has the initials “QR” (Quick Response) of the QR code and “pedia” of the name “Wikipedia”. The https://asean-retreat.org established in Bangkok (Thailand) has now started to develop a QR system that is aimed at the ASEAN countries and can be used, among other things, by shopping malls, shopping centers and all kinds of types. of meetings (eg exhibitions, museums and for educational purposes such as schools, universities etcetera.) The development of the KeWaSAN system is a ‘start-up’, it will take a few years before the system is operational. KeWaSAN will start with only pilot projects in Thailand, at a later stage it will be rolled out across other ASEAN countries. The challenging problem for https://asean-retreat.org is mainly that virtually all ASEAN countries (at least most of them) use their own unique ‘script’ that is very different from that in Europe and America. Almost completely on both continents the “Roman script” is used and the use of the “English Language” as a communication medium is practically everywhere; it’s not so within the ASEAN countries. What is NAS (Network Attached Storage) and Why is NAS Important for Small Businesses? Without access to their data, companies may not provide their customers with the expected level of service. Poor customer service, loss of sales or team collaboration problems are all examples of what can happen when information is not available. NAS devices are rapidly becoming popular with enterprise and small businesses in many industries as an effective, scalable, low-cost storage solution. IronWolf Pro hard drives are designed for NAS systems. An NAS device is a storage device connected to a network that allows storage and retrieval of data from a central location for authorised network users and varied clients. NAS devices are flexible and scale out, meaning that as you need additional storage, you can add to what you have. NAS is like having a private cloud in the office. It’s faster, less expensive and provides all the benefits of a public cloud on site, giving you complete control. NAS systems are perfect for SMBs. With a NAS, data is continually accessible, making it easy for employees to collaborate, respond to customers in a timely fashion, and promptly follow up on sales or other issues because information is in one place. Because NAS is like a private cloud, data may be accessed remotely using a network connection, meaning employees can work anywhere, anytime. Scattered storage arrangements will not work for SMBs. Built for network-attached storage servers, Seagate IronWolf Pro drives are the best choice for NAS applications and are developed in close co-ordination with leading NAS partners such as Synology, QNAP, Netgear, Drobo and others to provide the best experience possible. NAS is growing in popularity. And with good reasons. NAS servers allow access to company data 24×7, and using the right hard drive will provide the best experience possible. IronWolf Pro-equipped NAS servers help provide tremendous competitive advantages, increase levels of customer service, and extend the collaborative reach across any project, at any company. In many cases, the only limit to the usefulness of having a NAS solution in your business may be not having one at all! Vlaanderens culinaire rijkdom wordt Bourgondisch genoemd. In werkelijkheid hebben de Bourgondiërs hun gevoel voor smaak en kwaliteit van de Vlamingen afgekeken. De kip is mals, heerlijk hartig naast de prei, de wortel, de bleekselderij in de met ei gebonden roomsaus, en over alles groent geurige gehakte peterselie. Jazeker, dit is de Gentse waterzooi, en waar kun je die beter eten dan aan de waterkant van de Leie, waar ooit de handelsschepen aanlegden die de stad haar rijkdom bezorgden? Nu glijden er rondvaartbootjes tussen de rijk bebloemde kaden. Wij hebben er vanochtend ook een zonnige tocht mee gemaakt, vanuit het centrum tot aan de resten van de Prinsenhof, waar in het jaar 1500 keizer Karel V geboren werd en waar hij later residentie hield. Zou hij een gerecht als waterzooi gegeten hebben? De culinaire rijkdom van Vlaanderen wordt dikwijls in verband gebracht met het oude Bourgondische hertogdom waar het deel van uitmaakte, en waarvan keizer Karel de Habsburgse erfgenaam was. Daar is veel voor te zeggen. Maar eigenlijk kunnen we het beter omdraaien: de Bourgondische keuken is eerder Vlaams dan omgekeerd. Vlaanderen was in de veertiende en vijftiende eeuw het rijke deel van het hertogdom en de hertogen verbleven dan ook juist hier, in Mechelen, Lille, Gent en Brugge. De keuken van die tijd was duidelijk anders dan die van nu. Hartig en zoet werden niet gescheiden; er was geen dessert aan het einde van de maaltijd, althans geen opeenhoping van zoetigheid. Gangen waren er al evenmin. Of nee, ik zeg het fout. Gangen waren er wel degelijk, maar bestonden elk uit een grote variëteit aan schotels – zoiets als een buffet of een rijsttafel. Gerechten een voor een serveren is iets wat pas in de loop van de negentiende eeuw in zwang kwam. De oude Bourgondiërs – die dus dikwijls Vlamingen waren – snoepten van allerlei smaken door elkaar, en zoals gezegd: hartig en zoet stonden tegelijk op tafel. Zoet kwam van fruit, honing of de toen nog bijzonder dure suiker, die uit verre landen rond de Middellandse Zee werd geïmporteerd. Suiker en specerijen werden aan het hof met gulle hand over hartige gerechten gestrooid, niet omdat men de smaak van twijfelachtig vlees wilde verhullen (wie anders dan de hertog kon zich het allerbeste, meest verse vlees veroorloven? ), maar om de rijkdom te tonen. Eten we middeleeuws als we in Brugge of Mechelen aan de waterzooi gaan, aan de stoverij met bier, de paling in ’t groen? Nou en of. Dit soort bereidingen kunnen we bijna ongewijzigd in middeleeuwse kookboeken terugvinden, ook al wilde men toen graag zaken toevoegen als kaneel, foelie en gedroogde gember, iets waarvoor we nu minder warmlopen (hoewel, wellicht moeten we het eens proberen?). Vlees en vis werden langzaam gegaard in geurige bouillon en dan dikwijls op een snee brood geserveerd. Die snede heette aanvankelijk de ‘sop’, een naam die later overging op de nattigheid waarin hij lag. De glorietijd van Vlaanderen eindigde in de Tachtigjarige Oorlog, toen de Republiek der Zeven Verenigde Nederlanden zich losmaakte. De Zuidelijke Nederlanden bleven onder Spaans-Habsburgs gezag en de welvaart verplaatste zich naar het noorden. Niet dat dat voor de culinaire opvattingen veel uitmaakte. Vanaf de zeventiende eeuw groeide de Franse invloed op alle culturele aangelegenheden, de keuken en de tafelmanieren incluis. Het Franse hof was het schitterendste van Europa. Daar werden de nieuwe smaken en kooktechnieken ontwikkeld, daar wist men hoe de burger, maar eerst nog de aristocraat, moest epateren. In 1651 verscheen Le cuisinier françois van François de la Varenne, een toonaangevend werk dat vijftig jaar later vertaald werd uitgegeven als De geoeffende en ervaren keuken-meester, of de verstandige kok. Hierin werd voor het eerst saus gebonden met een ‘roux’ van bloem en vet. Fijne groenten als doperwtjes, asperges en artisjokken kwamen op tafel. En toen begon de zoetigheid op te schuiven naar het einde van de maaltijd. Vanuit Frankrijk kwamen in de eeuwen daarna de belangrijke nieuwigheden, zoals mayonaise en bearnaise, soufflés en bladerdeeg, waarmee onder andere de bouchée à la reine wordt gemaakt, nog altijd een gewaardeerd hapje in België. De Spaanse Nederlanden werden in 1714 Oostenrijks, maar ook dat is niet terug te vinden in de keuken. In de negentiende eeuw was België eventjes onderdeel van Nederland, maar al in 1830 werd het een zelfstandige staat. De Franse haute cuisine regeerde in heel Europa en de Vlamingen lustten er wel pap van. Een rumsteak bearnaise? Komt u maar door. Tournedos Rossini dan, belegd met ganzenlever en overgoten met madeirasaus met truffel? Smakelijk! Deze exquise Parijse bereidingen gaven de toon aan. Onder die elitaire oppervlakte bleven de oude recepten bestaan, bij de gewone mensen thuis. Konijn met pruimen bijvoorbeeld, middeleeuws door het combineren van zout en zoet. Paling in ’t groen met handenvol verse groene kruiden. Bloedworst, die hier ‘zwarte pens’ heet. En er kwamen nieuwe dingen bij. Aardappelen bijvoorbeeld. Na hun ontdekking in het verre Amerika werden ze aanvankelijk alleen als veevoer gebruikt. Hongersnoden en veranderende opvattingen zorgden er echter voor dat in de loop van de achttiende eeuw de patatten ook de mensenmonden in gingen, eerst bij de arme boeren, later ook bij de burgerij. Het frituren van reepjes aardappel is iets waarvan de oorsprong onduidelijk is. De Fransen claimen de uitvinding, maar waren het misschien toch de Belgen? Populair werd deze nieuwigheid pas aan het eind van de negentiende eeuw, toen de kosten van vet naar democratische waarden begonnen te dalen. In diezelfde tijd begonnen Vlamingen (en Nederlanders) hun stoverijen met aardappelen te stampen, met de ‘stoemp’ als resultaat. En daar zitten we dan, dit keer aan de Meir in Antwerpen, achter mosselen met friet en daarbij een bolleke De Koninck – bier is immers de vloeibare trots van Vlaanderen. Die mosselen zijn de bovenstebeste uit Zeeland: de jumbo’s of imperials waar de Belgen grif voor betalen (de kleintjes gaan naar Nederland). De frietjes zijn gebakken in ossenwit, het vet dat er die kenmerkende Belgische smaak aan geeft. Straks nog een dame blanche toe, of een pêche melba? Klassieke Franse gerechten, maar hier kun je ze nog vinden; smaak en kwaliteit zijn het allerbelangrijkst. In Vlaanderen heerst nu eenmaal een andere attitude ten aanzien van eten. Men praat erover, men trekt gemakkelijker de portemonnee. Een erfenis van die oude Bourgondiërs? Welnee, die zijn hier de kunst komen afkijken, zoals ik al zei. Net zoals wij nu doen. Van Onno Kleyn en zijn dochter, culinair historica Charlotte Kleyn, verscheen onlangs Luilekkerland – 400 jaar koken in Nederland (Amsterdam University Press). On the surface, street photography can seem like a simple practice: go out, wait for those lucky, incredible moments, and take the shot. But in reality, “street” is one of the most difficult forms of photography to pull off. You often need to wait for a very long time for those spectacular moments to occur, and when they do appear, you can miss the moment or ruin the shot. Still, getting great street photos is not impossible. Read on for seven street photography tips which will make everything much easier, both technically and conceptually. Practising these tips will help you roll the dice with much better odds. Raise Your ISO Street scenes move lightning quick. Some of the best moments will appear and disappear in front of you in an instant. To offset this, you have to set your camera to be able to catch these fast-moving scenes. The most important setting is your shutter speed. The shutter speed I prefer to use is 1/250th of a second, which will guarantee that your subjects will be sharp. At night you can go slower, to 1/160th or 1/125 in order to let in more light, but slower than that will introduce motion blur. Secondly, I prefer to use a smaller aperture (when possible) so that I get more depth of field in the image. This is a personal preference, of course. I prefer it because there’s less of a chance to screw up your images. If you miss the focus on your main subject slightly, a larger depth of field will minimise the chances of that ruining the photo. If you have multiple interesting subjects entering your scene at different depths or if you have a great subject and a great background, a smaller aperture will allow you to get them all as sharp as possible. But unless you are shooting in direct sunlight, the only way to use a fast shutter speed and a small aperture is to raise your ISO. I have a chiffon cake theory! Based on many different chiffon cakes that I have baked at here, here, here, here and especially this banana chiffon cake recipe, I realised something! The chiffon cakes that I baked without adding cream of tartar, baking powder or any cake raising agents are the BEST being so moist, tender and cottony soft!!! Really? Despite the fact that the cream of tartar and baking powder will make chiffon cakes looking tall, fluffy, impressive, structurally stable and easier to bake and handle, these cake-rising ingredients tend to make the cakes structurally stiffer and kill their ultimate softness! Hence, in my opinion, chiffon cakes with cream of tartar and baking powder are good but they are NOT as ultimately good as those that are made with NO cake raising agents!!! Convinced? 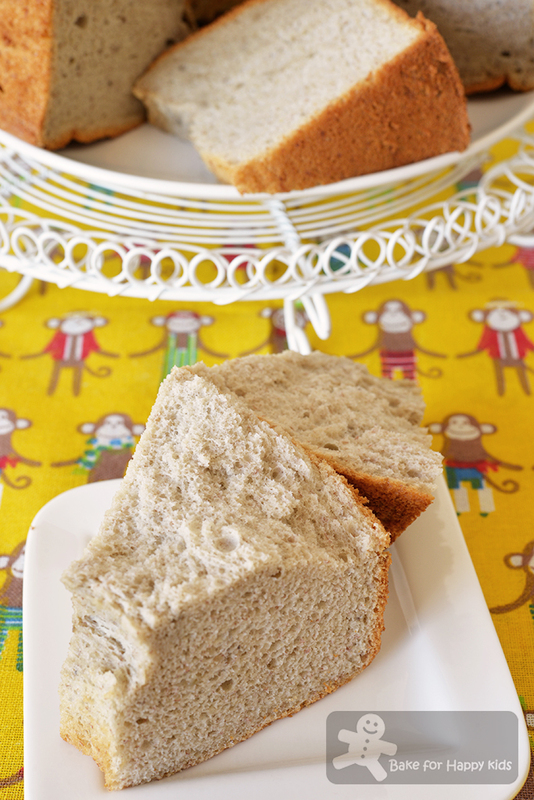 Here, I have an ULTIMATE banana chiffon cake recipe to share. With NO cream of tartar, I have to say that this is the BEST banana chiffon cake that I have baked so far!!! It is tall, fluffy, impressive, very very very moist and very very very ultra soft!!! Trust me… I have never taste any chiffon cakes that are softer and moister than this. This is truly the ultimate!!! Best of all, it contains no sourish cream of tartar aftertaste. So delicious and banana-y that you don’t even need to add aromatic spices like cinnamon or vanilla to boost its flavours. Must try!!! Must try!!! And I hope that you will be convinced that my chiffon cake theory is right!!! 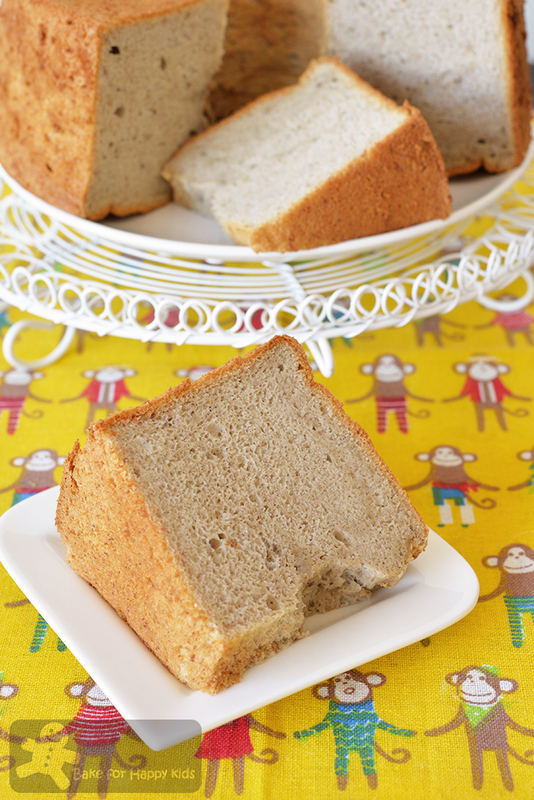 Finally… This is the ultimate banana chiffon cake that I’m after! My husband and son can clearly tasted its ultimacy and told me the same too!!! In order to bake this tall and ultra soft chiffon cake, you can fill 90% of your chiffon cake pan with the cake batter and with no worries!!! This chiffon cake will rise above the rim of your pan and won’t create any mess with dripping cake batter or exploding cake top. However, without the addition of cream of tartar or any raising agents, the cake will shrink but only slightly to the exact size of the pan after cooling. The cake will rise above the rim of the pan but will shrink to the exact size of the pan after cooling. This is how the cake looks after it is completely cooled. One: The most important, Egg White Mixture! 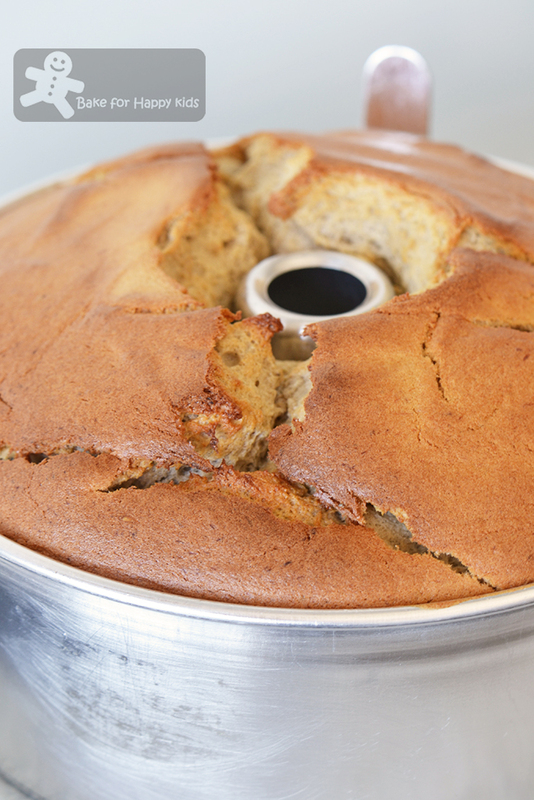 The success of this chiffon cake is highly depending on the egg white mixture used because there is no other chemical agents used to stabilise the cake structure. To make sure that the egg white mixture is whipped into its best form, it is essential to beat egg whites in the lowest speed at the beginning for at least 10 mins to stabilise the mixture. Then, increase the beating speed to medium. Please be aware… To avoid large bubbles forming, do not use high beating speed. To avoid the meringue from being too dry and stiff, do not over-beat the mixture. Stop beating immediately when stiff peaks form. Two: Please handle me with care! Without the cream of tartar, please be aware this cake is very cottony soft and can be very fragile to cut and handle! Thus, please do not unmould the cake by pressing it!!! To unmould, please use a blunt thin plastic spatula or knife to run along the cake’s edges and gently push the cake out from the pan. Three: The cake has to be baked for at least 65 mins!!! Due to its high moisture content, this cake has to be baked for at least 65 mins. If the top of the cake turns brown too quickly, cover the top loosely with a foil after 30-40 mins of baking and continue to bake it until it is thoroughly cooked. Please be aware that uncooked cake will shrink very badly to form patches of doughy area!!! Ewww… And over-cooked cake will be too dry. Therefore, I would say 65 to 75 mins of baking is the best. Four: This banana cake is so good on its own! Believe me or not! It’s true that this cake is mostly naturally sweetened by lots of banana and the minimal 75g sugar added is essentially adequate enough to whip up a decent meringue! So please do not reduce the amount of sugar any further as the sweetness of this cake is just right. As mentioned earlier, I reckon that the addition of the aromatic cinnamon or vanilla is absolutely not required in this recipe! However, if you think that you want to add these ingredients into your cake, please feel free to do so. I wouldn’t because I just want to taste nothing but only the banana in this cake. Now who want to sing the minions’ banana song? Ba-ba-ba-ba-ba-nana LOL! Update on 5/10/2017: I have one more important tip to mention!!! It’s ok to have some cracks on this cake!!! Please do not bake this cake with too low oven temperature or a tray of boiling water. Detailed explanation is at here. Now, what do you think about my chiffon cake theory? Agree? Disagree? Agree to disagree? LOL! After baking this ultra soft banana chiffon cake, I feel like I have gained some sort of cake enlightenment!!! LOL! Thus, if you like this ultimate ultra soft banana chiffon cake, I have a lot more of my newly-derived ultra soft chiffon cake recipes to share in the near future and so please stay tune! You can follow me at either my Facebook at here or here or my Instagram @zoebakeforhappykids. It’s time again that I need a break!!! I just did my 5th marathon and my timing is 03:52:59. Just seconds faster than my previous run but I felt so much better this time because I was running in a steady pace. Too old already… So no need to chiong (meaning dash in Singlish)… LOL! 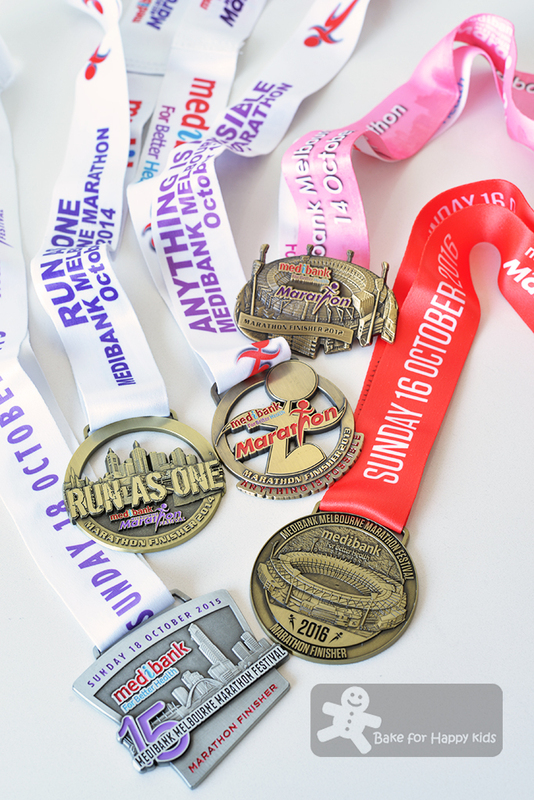 Happy that I have completed 5 marathons! Here’s the recipe that is mostly adapted from here. Use a handheld blender or a small food processor to process the bananas into smooth purée. Set aside. Using a hand whisk, combine egg yolks, oil, milk and bananas in a large mixing bowl until well combined. Sift in cake flour and salt and whisk gently until the batter is smooth and combined. Using an electric mixer with a whisk attachment, beat egg whites in the lowest speed for at least 10 mins to stabilise the mixture. Increase beating speed to medium (not too high to avoid large bubbles forming). While beating, add sugar gradually and continue to beat until stiff peaks form and the meringue should be smooth with very tiny bubbles. Do not over-beat the mixture. Pour batter into an un-greased 20 cm chiffon tube pan. Use a spatula or spoon to distribute the batter evenly in the pan. Give the pan a gentle tap and bake at 170°C/330ºF for 10 mins. Reduce temperature to 160°C/320ºF and bake for 55-65 mins or until it is thoroughly cooked. Total baking time has to be at least 65 mins. If the top of the cake turns brown too quickly after 30-40 mins of baking, cover the cake top loosely with a foil and continue to bake until it is thoroughly cooked. Remove from oven and invert the cake immediately to cool on a wire rack. Allow the cake to cool completely in the pan before removing it from the pan. The cake is fragile and so it is easier to slice with a serrated knife. Enjoy! Store any uneaten in an airtight container at room temperature for up to 3 days. This cake will stay super ultra moist and soft for many days until they are all gone!